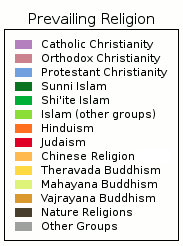 These data are often based on census or public opinion data.2 A person is considered to be of a particular religion if they say that they are of that faith. Thus, as of 2015, about 70% of the adults in both the U.S. and Canada are Christians. The U.S. number is gradually declining about 1 percentage point per year, even though the total population of the U.S. is increasing. Many individuals and religious groups have much more strict definitions for membership. For example, many conservative Christians believe that one has to be "born again" in order to be counted as a Christian. Using this definition, only about 35% of Americans would be counted as Christians. This difference in definitions between conservative Christians and the rest of the population causes much confusion. Some of the approximately 1,000 Christian faith groups in the U.S. and Canada believe themselves to be the only true Christian denomination. Thus, depending on the definition used, the perceived percentage of Christians in the U.S. are between 0.1 and 75% of the total population. This map shows the most popular organized religion in each country of the world. So, for example, The Netherlands is shown as steel blue (mixed Catholic and Protestant) even though the largest group in the country are NOTAs (persons NOT Affiliated with any organized religion). Similarly, the UK is shown as Protestant Christianity even though weekly church attendance is in the single digits. Note 1: Persons with no formal, organized religion include Agnostics, Atheists, Deists, freethinkers, humanists, secularists, etc. Their numbers are growing in Europe, North America, and other places. With the collapse of Communism in the USSR, the total numbers worldwide dropped precipitously and are now increasing. Note 2: There is no consensus on the number of Buddhists in the worlds. More info. Note 3: There is no consensus on the data of founding of Judaism. Some claim that Adam and Eve were the first Jews, and lived circa 4000 BCE; others suggest that they, and all biblical persons prior to King David are mythical; they never existed. Some would place the date at the time of Abraham, circa 1900 BCE. Some date it to the Exodus from Egypt circa 1490 BCE. Others say that no Exodus happened. On the basis of archeological evidence, many believe that the ancient Hebrews were originally a group of Canaanites who gradually separated from the main body and eventually developed a separate culture. That would certainly explain why so many Jewish holy days were derived from the Pagan Canaanite culture. Note 5: We have included Wicca even though their numbers are small because such a large percentage of our site's visitors are of that faith. There is no reliable measure of their numbers. Some Wiccans believe that their faith can be traced back to the origins of the Celtic people; other suggest it is a recently created religion and is based on ancient symbols, deities, seasonal celebration, and other factors. J.W. Wright, Editor, "The Universal Almanac, 1996", Andrews & McMeel, Kansas City.